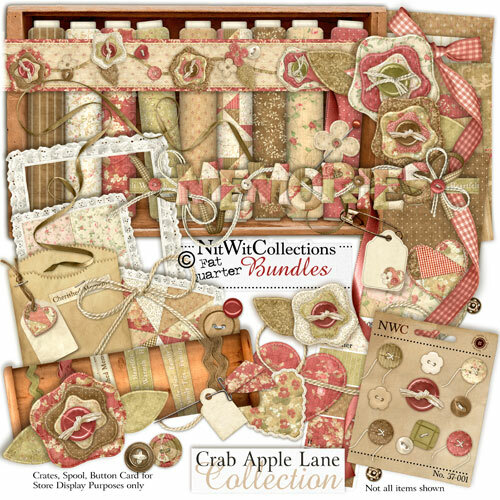 My "Crab Apple Lane" Collection is yet another in this series! Can ya tell I'm a secret quilter-wannabe? hahahaha Oh I bet ya can... especially after seeing this new STUFFED collection inspired by all things quilty and wonderful! I couldn't seem to stop myself once I got started so that is why this one ended up being a STUFFED kit! It's chock full of tons and tons of wonderful fabricy flowers, borders, squares, and backgrounds! I absolutely had a ball making it and have a feeling I'm gonna have to another like it soon! hahahaha I believe this one will be perfect for all your heritage, family, cherished photos... all those special "captured" moments of yours!